For those without comedic tastes, the so-called experts at Wikipedia have an article about Homer. 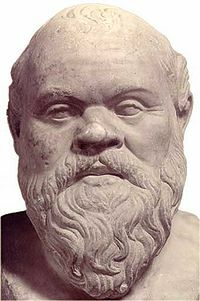 A picture of Socrates, who is frankly cooler than Homer anyway. If you clicked this link looking for Homer Simpson, develop more culture. Homer (born 789 BC) was a poet who knew it who grew up in ancient Greece. According to historians, Homer was completely blind, and at the same time was in fact more than one person. Recent research by Baldrick, Cambridge University's leading archaeologist, has shown that Homer's most likely identities were Stephen Fry and Hugh Laurie, with a dash of Alan Davies thrown in for good measure. The avalidity of this claim is open to debate, however, following interviews with Fry in the early 1980s. It is a little known fact that he was a keen inventor, coming up with such useful everyday items as the toaster, Angel Delight and the lever-arch file. Homer is most famous for his two best selling books, the first being The Iliad: A Deeper Study'', and The Odyssey : Fokkers in Stormy Waters. The first is his award-winning thesis on exactly why Greeks are so terrible at everything american, the answer of course being that they're not true American cowboys. The second is the sequel, dealing with the consequences of the first book, mainly on why every country but Greece is "totally awesome". This has a grain of truth to it, as we all know that Greece is not America. He was famous for writing the poems The Iliad, about a poorly commercial, and The Oddyssee, the tale of a small alien named Abe that was released on the Sony Playstation in 1997. Homer was also responsible for writing the lyrics to Jean Michel-Jarre's seminal classic Oxygene XXIII, for which he won six Ivor Novello Awards in 1954. Homer took a liking to the internet during his final days, and spent most of his time on MySpace, chatting with his online girlfriend from Lost Angeles. Homer could be found mostly on imdb, where he fiercely defended his status as 'oldest man on the site', a title he held ever since it was proved that Bob Hope was, in fact, a gerbil. Homer was also incredibly famous for his competetive eating career. He won numerous awards in the Gyro-eating contests, and even won the Food Olympics in that area for an unprecedented 12 years in a row. However, his career was cut short when he accidentally choked on a toothpick. The irony is that the toothpick would not have cut through him if it had one of those small plastic colored wrap thingies on the end of it, the very thing Homer requested to have removed. It was the only time he had it removed, since it was actually a dare to see if he could eat an all-toothpick gyro. Homer Simpson, who he was named after. Socrates, Homer's pal and the inventor of the sock. Plato, Homer's other pal and inventor of the plate. Aristotle, Homer's final mate and inventor of the arse. Idiocrates, who didn't like Homer all that much but hung around him for scientific kudos. Mediocrates, who only read Homer because his local reviewer liked him. This page was last edited on 3 October 2012, at 03:57.